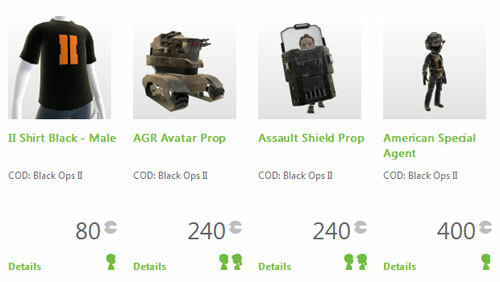 The Xbox LIVE Marketplace now has 16 different Call of Duty: Black Ops 2 avatar items available for purchase. The T-Shirts and Hats are 80 MS Points each and special props, like the AGR and Assault Shield, are 240 MS Points. The Special Force and Zombie outfits cost 400 points. Login to Xbox LIVE and check them out.